All transactions are safe and secure with a reliable history in online purchasing behind each of our associates. 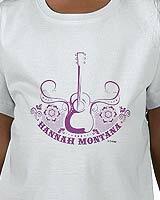 Buy the Hannah Montana Guitar t-shirt to own Hannah Montana clothing and merchandise. The stylish purple design on this attractive piece of Hannah Montana apparel features a guitar with the name "Hannah Montana" underneath. It's the perfect attire to where to your next Hannah Montana karaoke party. You'll feel like a secret celebrity as you belt out songs like "Nobody's Perfect" and "If We Were a Movie". Your star power might even put the Jake Ryan in your life under your spell. The design on these Hannah Montana t-shirts can also be purchased on adult size tees and hoodies. In addition to the Hannah Montana Guitar tee above, browse the Hannah Montana Clothing Gallery for more apparel like men's and women's clothes, kids shirts or hoodies.